Leaflets calling for members of the Ahmadi Muslim community to be killed have allegedly been distributed in universities, mosques and shopping centres in London. Followers of the Muslim Ahmadi sect, which preaches a message of peace and tolerance, have long been subject to violent attacks and persecution in Pakistan, where they are branded worse than apostates by hardliners and forbidden by the state to call themselves Muslims. Now the wave of persecution appears to have spread to the UK, with a man admitting in a public statement that he killed Ahmadi shopkeeper Asad Shah in Glasgow for disrespecting Islam. The unusual statement coincides with the distribution across London of leaflets calling for followers of the religion to be killed. A leaflet undersigned by the global anti-Ahmadiyya Khatme Nubuwwat organisation in Stockwell Green, and distributed in several London locations, has been obtained by IBTimes UK. The group denies spreading anti-Ahmadiyya hate speech. Entitled “Qadianis [a pejorative name for Ahmadiyya], Difference With Other Non-Muslims”, it asks why “this group is considered wicked [sic] than others?” and declares for Muslims “to have any kind of relation with Qadianis is prohibited”. • In October 2012, the notices were distributed on the campus of University College London at an event held by the university’s Ahmadiyya Students Association in response to the controversial anti-Islam film the Innocence of Muslims. Ahmadiyya student association members claim the leaflets were also distributed on subsequent occasions, but university authorities say they are not aware of this. They have also allegedly been distributed as recently as 2014 on the campuses of Kingston University and Westminster University, where Islamic State executioner Mohammed Emwazi studied. • The anti-Ahmadiyya propaganda have been allegedly distributed to members of the public in Wandsworth Road and outside Tooting Market, south London, on several occasions in 2014 and 2015. • They have also allegedly been distributed outside the Khatme Nubuwwat Academy office in Forest Gate, east London on several occasions in 2014 and 2015. 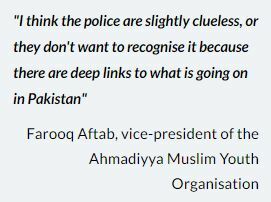 “You can have differences of opinion, but where it leads to hate, or incitement to violence, or promoting violence, it is unacceptable,” Farooq Aftab, vice-president of the Ahmadiyya Muslim Youth Organisation, told IBTimes UK. On Thursday, 7 April, Glasgow Ahmadi community leader Ahmed Owusu-Konadu called on all Muslims to condemen the killing of Shah. Aftab said the message of intolerance had even spread to schools, with Ahmadi children bullied and ostracised by their peers. He added that he had been told of incidents in east London schools in which “kids are sitting with friends and are told we are not going to associate with you because you’re an Ahmadi”. Aftab said that police had been informed repeatedly about the leaflets. “I think the police are slightly clueless, or they don’t want to recognise it because there are deep links to what is going on in Pakistan,” he said. Abdul Fariq Khan, who ran an Ahmadiyya Students Association group at Manchester University, said that on campuses throughout the country, members of the Islamic Society called for Muslim students to boycott events held by Ahmadiyya students. “You will always find that there has been an email or somebody important from the society or the Muslim community of that university has said you should never be going to this kind of event, you should never talk to them or engage with them. And that happens very regularly and it is across the country,” Khan said. Founded in British-controlled northern India in the late 19th century, the Ahmadi are considered heretical by other Muslims because they revere founder Mirza Ghulam Ahmad, who died in 1908, as the saviour. After Ahmadiyya were prohibited in Pakistan from calling themselves Muslims in 1984, the group moved its headquarters to Morden, south London, where it faced renewed persecution from Muslim hardliners. In 2010, Ofcom penalised an Islamic satellite channel affiliated with Khatme Nubuwwat after it described Ahmadiyya as “liable for death”. In an email, Khatme Nubuwwat spokesman Akber Choudhry denied all allegations of propagating anti-Ahmadiyya hate speech. “We completely denied these unfounded allegations then, and we deny them now,” he said. “We believe in tolerance and the sanctity of every human life. Our work is just to counter the propaganda of the Ahmadiyya Qadiani religion, and their proselytisation among Muslim youth. For this work, they hate us and try to use more propaganda. “Muslims, as citizens of the UK, have the right to associate with whoever they please. Muslims regard the Qadiani Ahmadiyya as a distinct religion, so the association may be limited by personal faith and preference,” he added. Kingston University spokeswoman Anita Gupta said that following an investigation, university authorities had been unable to uncover any instances of the leaflets being distributed on campus. Metropolitan Police and the Islamic Society have not responded to requests for comment.